The northern Pacific Elephant Seal once numbered in the tens of thousands until the 19th century when hunters, killing them for their oil-rich blubber, cut that number to just a few hundred animals. The species was thought to be extinct in 1884 until a remnant population of eight individuals was discovered off Baja California in 1892. In 1922, the Mexican government banned hunting, followed shortly thereafter by the United States government. Since then, the population of northern elephant seals has recovered at an average rate of six percent per year. Today, thanks to government protection and the seals’ distant lives at sea, the worldwide population has grown to an estimated 150,000 seals. After being absent for more than 150 years, elephant seals, which can reach 15 foot long and 6,000 pounds, returned to the sandy beaches on California’s Point Reyes Headlands in the early 1970s. In 1981, the first breeding pair was discovered. Since then, researchers have found that the colony is growing at a dramatic annual average rate of 16 percent. The animals spend 80 percent of their life in the open sea. Not only do they spend most of their life in the ocean, 90 percent of that time is spent underwater: eating, sleeping, digesting, and traveling. Their semi-annual sojourns to the shores of Point Reyes National Seashore provide a unique opportunity to glimpse the lives and behaviors of these elusive ocean giants. 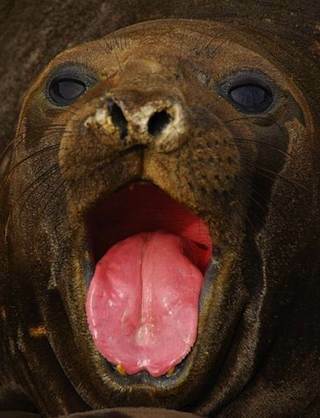 Learn all about the Elephant Seal and their California caretakers at the National Park Service: www.nps.gov.